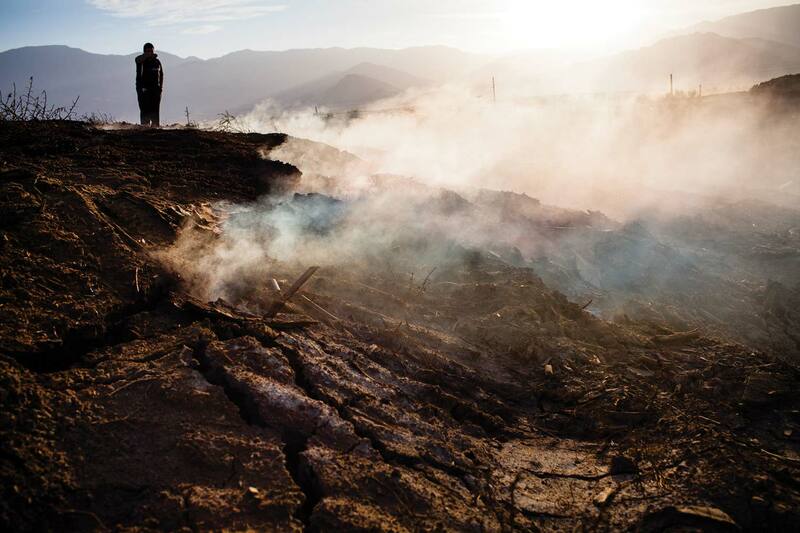 Activist Eduardo Guevara takes a picture inside Lawson Dump as smoke rises from a fire smoldering below ground. Although it was ordered closed in 2006, underground fires continued to burn for years afterward, and residents of nearby mobile home parks continued to complain about noxious odors and possible contamination. Photo by Roberto (Bear) Guerra. For the last several years, Homelands’ Ruxandra Guidi and Bear Guerra have been visiting California’s Coachella Valley to document the environmental and health disasters there, from contaminated water to pesticide pollution to hazardous waste. Now, in a major piece for High Country News, they introduce us to Mexican and Central American immigrants who no longer want to be seen as victims. Read Rux’s article and see Bear’s photos here. El artículo también está disponible en español. 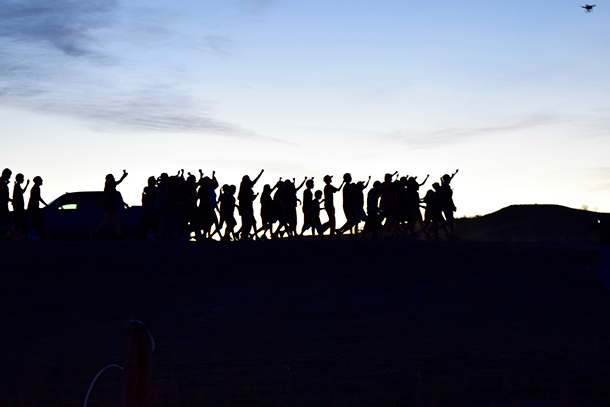 A group of youth demonstrators marching from Cannonball River to the Oceti Sakowin Campground. Photo by Jacqueline Keeler. Sandy Tolan made five trips to North Dakota this past fall and winter to document the standoff between opponents of the Dakota Access Pipeline and the pipeline’s supporters in government and business. As he reported on the conflict, he came to realize that the Standing Rock protests were part of a much larger story. Facing declining demand at home, U.S. oil and gas companies are rushing to finish projects designed to strengthen their positions in world export markets. And everywhere they go, they are meeting resistance from indigenous groups and climate activists. Sandy spent the last five months talking to politicians and oil company executives, who talk of making America “energy independent,” and activists all over the country worried about their land, their culture, and the future of the planet. 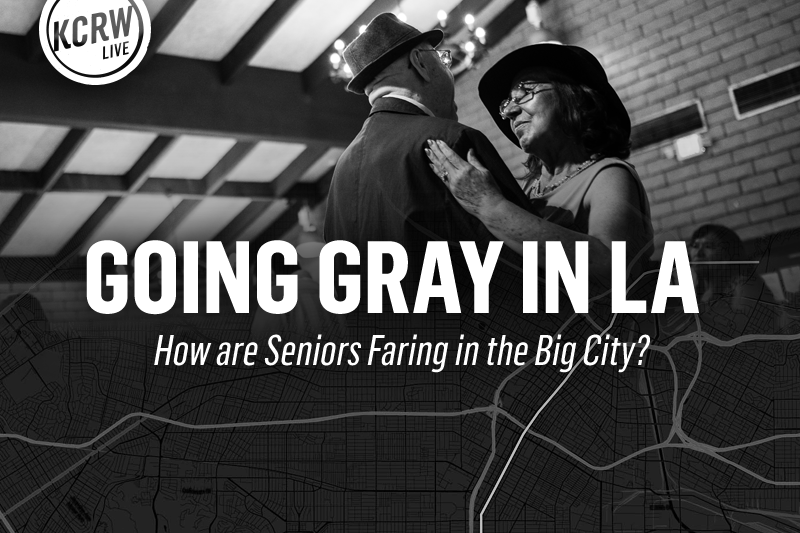 On April 9th, Bear and Rux’s year-long collaboration with LA’s KCRW – Going Gray in LA: Stories of Aging Along Broadway – will have a culminating event in Los Angeles that’s free and open to the public. They’ll be showing some of Bear’s photos from the project and will be joined by a few of the people featured in their stories on stage, to talk about aging in a big city built for the young. Please help us spread the word, and we hope to see you there! 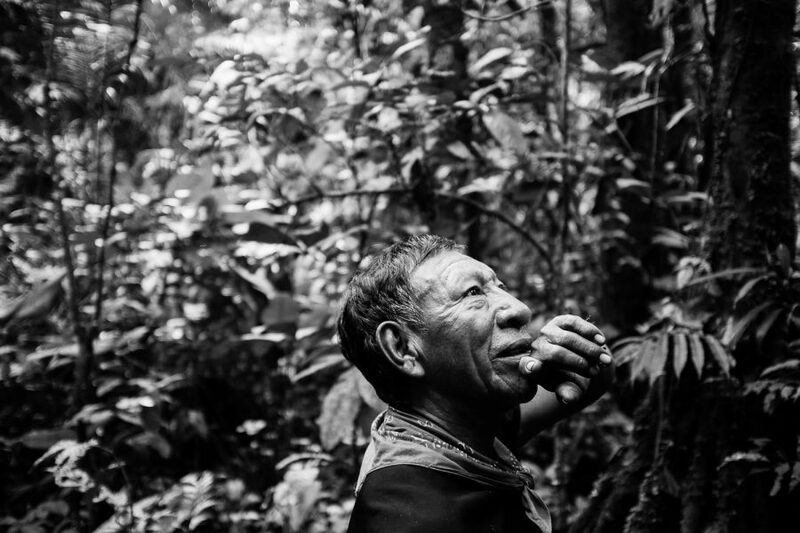 Last year, Homelands’ Bear Guerra spent two weeks in the Ecuadorian Amazon making images to accompany anthropologist Mike Cepek’s upcoming ethnography about the impacts that oil has had on the life of the indigenous Cofán. The book, Life in Oil: Surviving Disaster in the Petroleum Fields of Amazonia, will be published by University of Texas Press in 2018, and will be illustrated by 40 of Bear’s images. A selection of those images has just been published as a photo essay in the March/April 2017 issue of Pacific Standard magazine. The images, with an introductory text by Cepek, can also be viewed online. 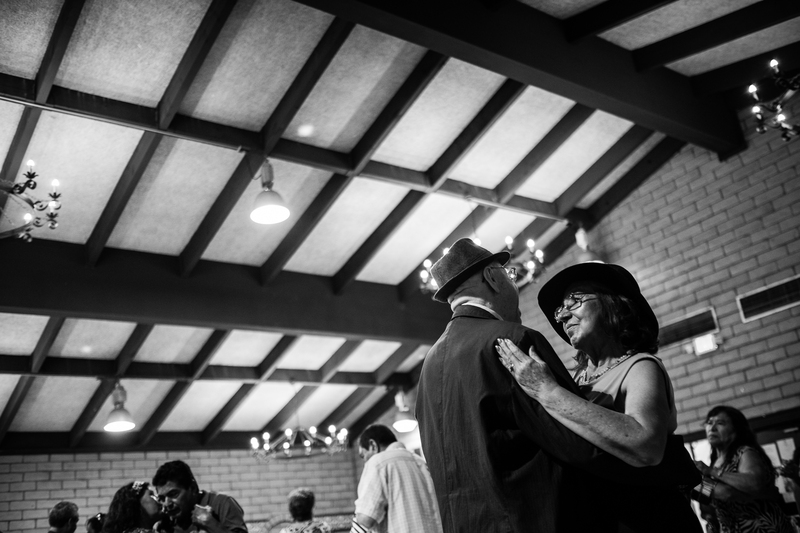 Chuy Hernandez (right) shares a dance with Olegario Martinez at the Lincoln Heights Senior Center’s weekly baile. Photo by Bear Guerra. Los Angeles is a rapidly aging city in a rapidly aging county. In fact, over the next 15 years, LA County’s senior population will double, to nearly one-fifth of the total population. Housing, health care, and the job market will have to adapt to a population that is working and living longer in a city built for the young. Since August 2016, reporter Ruxandra Guidi and photographer Bear Guerra have been traveling the length of Broadway, an 18-mile-long avenue that cuts through the working class heart of the city, to find out how LA is changing. They’ve been documenting their journey in radio stories, photo essays, blog posts, and public exhibitions and events. Funded by the Eisner Foundation, Going Gray in LA is a project of radio station KCRW in Santa Monica, California. The Selma of the North? Police use water cannons to clear a protest camp at Standing Rock in North Dakota. Photo by Unicorn Riot via Vimeo. Sandy Tolan spent several weeks researching a piece for the Daily Beast (to be co-published by Reveal, from the Center for Investigative Reporting) on police violence at Standing Rock, with reporting gathered over his five trips there since October. 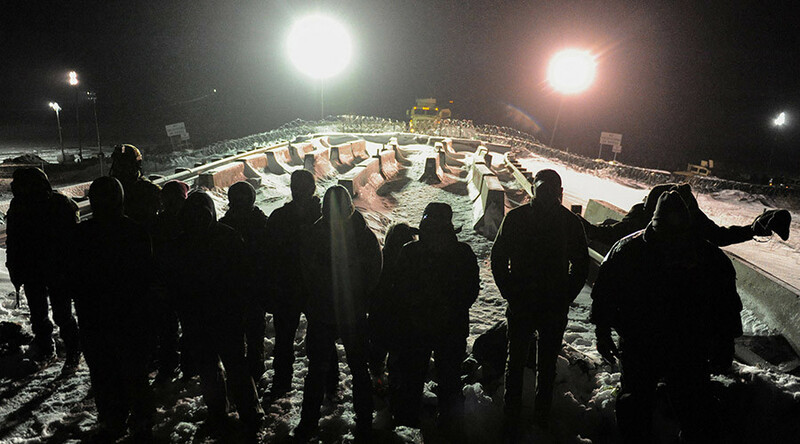 U.S. veterans prepare to confront police near the Cannonball River. 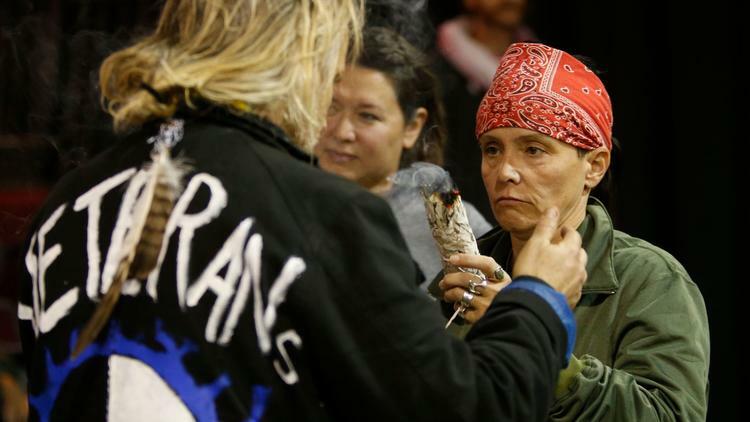 Sandy Tolan reports that relations between protesters and the tribes are now strained. Photo by Stephanie Keith, Reuters. 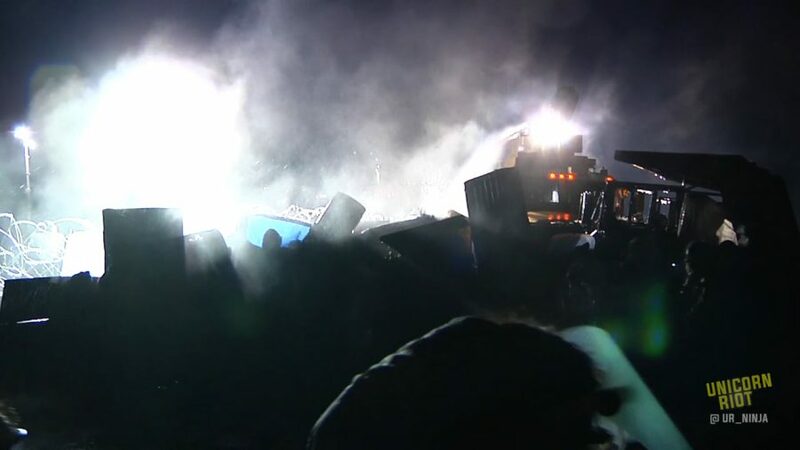 Sandy Tolan has returned to North Dakota to report on the status of the Dakota Access Pipeline protests in the aftermath of the presidential order instructing the Army Corps of Engineers to expedite the approval of construction permits. Sandy found growing conflict between tribal leaders and the “water protectors” who have set up protest camps near the proposed pipeline path. You can read his piece on The Daily Beast. Veterans apologized to tribal leaders for past misdeeds committed against Native Americans by the U.S. military. Photo by Mark Boster, Los Angeles Times. At a time when so much of the nation is divided by politics and ideology, the protest against the Dakota Access pipeline in North Dakota forged an unlikely coalition of veterans, Native Americans, and environmentalists who produced an even more unlikely outcome. Sandy Tolan‘s story from Cannon Ball, ND, appeared in the Los Angeles Times on December 11. It’s a moving account of an emotional encounter.